It is most popular in the countries, United States & India. Topics: Content Area, Acc Chapters, and Cardiovascular Leadership Institute. Age: It went live on March 28th 1994, making it over 24 years, 0 months old. expo.acc.org ACC.12 Expo - Welcome, Exhibitors! 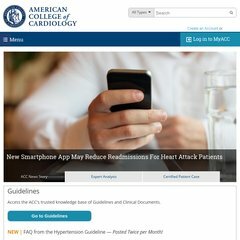 stage.acc.org ACC/AHA/ASE 2003 Guideline Update for the Clinical Application of .. The estimated 374 daily visitors, each view 1.80 pages on average. It is hosted by American College Of Cardiology (District Of Columbia, Washington,) using Microsoft-IIS/7 web server. ASP.NET is its coding language environment. There are 3 Nameservers, ns2.acc.org, ns2.mydyndns.org, and ns1.acc.org. PING www. (68.177.228.141) 56(84) bytes of data. Website load time is 3817 milliseconds, less than 75% of other measured websites. As well, a ping to the server is timed at 47.9 ms.